We are starting a new monthly challenge on the Viva Las Vegastamps! Blog. Each month we will pick a new theme and we hope you play along with us. At the beginning of the next month, we will pick a winner and that card will be featured on our Blog and the winner will receive a $25.00 Gift Certificate to our online store or if you are visiting Las Vegas, stop by our Retail Store to use your Gift Certificate. 4) Winner will have their Card featured on our Blog - how exciting it that! Hello...Jennifer here, with TWO projects for you today! First...it's my first Christmas Card of the season...well, ALMOST Christmas Card. In this first project - shown above - you will see Santa snoozing under a cactus #3541 from Viva Las Vegastamps! He's NOT quite ready to make his list and check it twice! I wanted to see how many elements I could get into this one. I have metal embellies, velvet/sparkle ribbon, patterned paper, solid card stock, craft markers, metallic gel pens, ink, and a phrase sticker. For my next project I decided to go 'dumpster diving'. Not literally. I used an old Library Book Card Holder for the back - made it into a funky envelop for any occasion. I also found an old starter tag that I have had in my stash for years. I added one of my Mousy VLVS to it and played around with my Ranger Inks. I added some swirl bling and sparkle flower and brad. I hope you will stop by my blog located HERE and say HI...I have been very busy and have LOTS of new projects posted! Enjoy your day! Today I bring a tag --- and an embossing with a little embellishment! The stamp I chose to show off today was the Steam Engine! This stamp is SO amazing -- it's a little diagram of a steam engine, and the detail is AMAZING. I grabbed some paper by basic grey.. cut it into a tag shape and embossed my stamp on it with smooth black embossing powder. I then took the Stampo's Steampunk Sprockets and Gears and Stuff and added adornments to my embossing! I did a little crackling and inking on some grungeboard.. a bit of creative "coffee ring" placement and did some doodling.. and VIOLA! Thanks so much for continuing to check out what I have to show for VLVS! each week! There's a design team call going on right now for next term's team, so be sure to apply!!! Hello again! For my post this time, I decided to mix weird and funny (again). While browsing through the Viva Las Vegastamps! 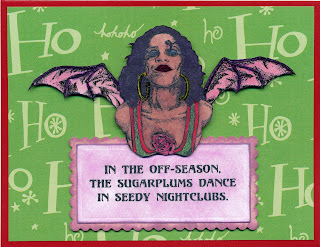 online store, I found this sentiment that says “In the off-season, the sugarplums dance in seedy nightclubs.” I knew right away that I could make a funny card with this one, so I bought it! While browsing in their store one day I found this stamp of the Hoop Earring Lady #17634 and also noticed the cool set of Bat Wings as well. So I stamped all the stamps on white cardstock, and then colored them with Copic markers. For the sentiment, I cut it out with two Spellbinders shapes and then inked with chalk ink. I wanted to make lots of poles to put across the front of the card, but forgot to order the candy cane stamp to make them with. So instead, I found a cool piece of patterned paper that says “Ho Ho Ho” all over it. I thought it would work well in this situation! I wanted to highlight some areas, so I added Ultra High Gloss Embossing Powder to the lips, flower, hoop earrings, and parts of the wings. Then I cut out all of my images, touched up the white edges and adhered them to my card with pop dots to make it look three dimensional and more interesting. Please visit www.stampo.com to check out the galleries and forum for more cool ideas. 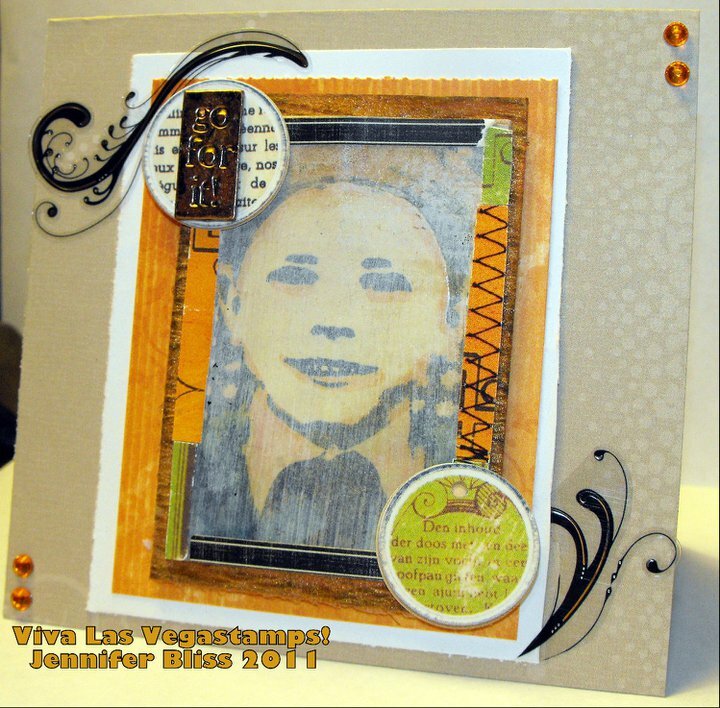 You can also visit my blog at http://www.createncraft.com/ and then click Blogs and Joe Morgan to see all of my Viva Las Vegastamps! projects in one place! Hi, Terri Sproul here to get you excited about Christmas - YES, Christmas... I just love making Christmas Cards all year long. I do a blog hop twice a month on my blog with just Christmas Cards. Viva Las Vegastamps! has some great Christmas stamps to purchase. Hope you stop by and make some Christmas Cards with me. 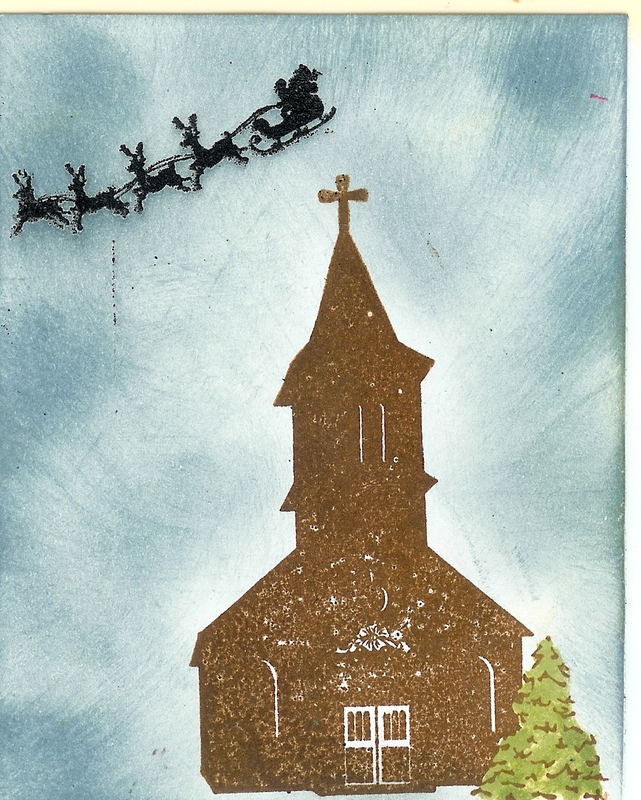 2) Stamp Santa flying image toward the top of the cardstock with "Black Soot" and emboss with Black Soot embossing powder. 3) place cardstock onto Teflon sheet and start adding your "Stormy Sky" ink - starting on the outside edge and working your way into the center - Do NOT ink the Church. 4) Spray a small amount of "Wheat Grass" ink onto your Teflon sheet - and pick up ink with small paint brush. Paint the tree image with ink. I will add this to a front of a card using my Miracle Tape and I am done... So easy to do. ARE you making your Christmas Cards yet?? If not check out our Festive Friday blog hop every 2nd and 4th Friday of each month for more ideas. 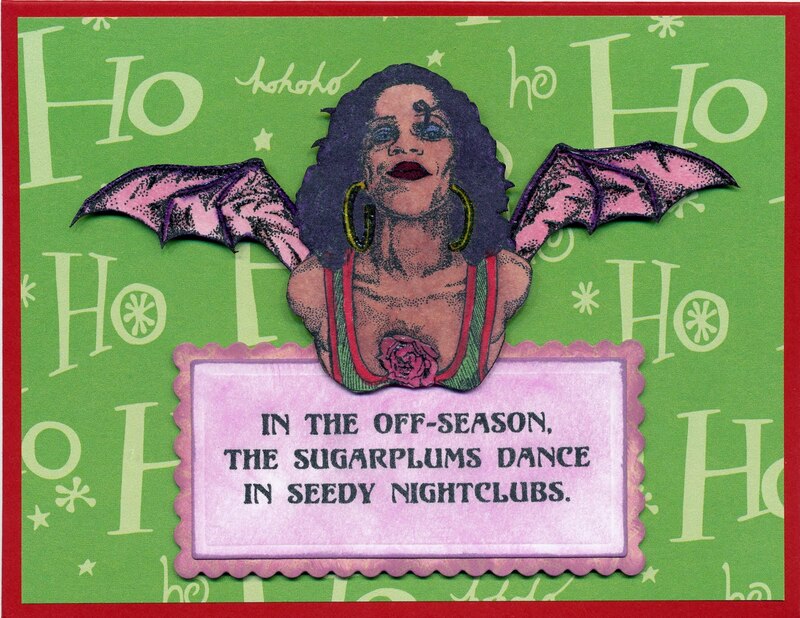 Hope you stop by my blog on the 26th of August to see more Christmas Cards. Thank you for stopping by today. 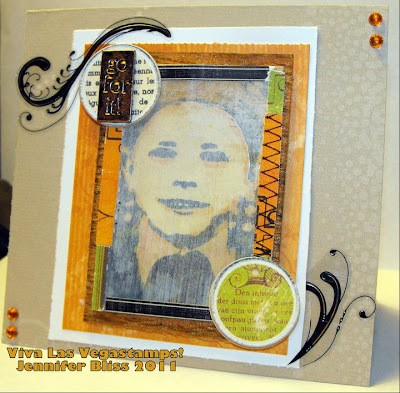 It's Kim here again, with another Viva Las Vegastamps project. Today I have the pleasure of sharing a card I made for a friend. I used the Antique Car stamp as the focal point of this card. I stamped it with Ancient Page Chocolate Brown ink on a cream colored cardstock, then used Nestibilities to die cut the shape. I then die cut two Nestibilties Labels and cut them each in half and using Miracle Tape, attached the pieces to the back of the car piece. The sentiment just cracks me up, you can find it Here. I stamped it with the Ancient Page Chocolate Brown, then die cut with a Nestibilities Grommet Tag shape. All edges were distressed with Spun Sugar, and Tea Dye Distress Inks. Are you finding some time to relax?? I know I would love more time for that!! Relaxing and reading a good book. I inked this stamp with 2 shades of brown. You really can't see to much of a difference unless you look really close. The relax is spelled out with some fabric stickers that I've had for a while. 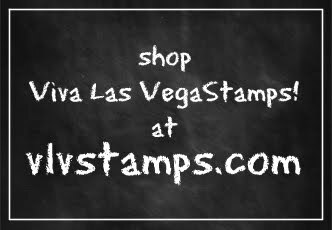 Make sure you stop by Viva Las Vegastamps web site. they also have a forum and a great gallery you can check out too!! Hi there! Jennifer with you today! Here's my project for this week! I started off thinking I was going to try an ATC and wasn't really jazzed about it when I was done so I turned it into a card instead. available at Viva Las Vegastamps on my surface. I then colored it and added some Ranger Ink over top and faded a little then covered it with Gesso...and scraped so you could see the print below. I added scraps of various adhesive for the border of the image. The layer under that is a little hard to notice but it's textured paper that I added Smootch - Mocha to. For the next layer I used some orange paper from my stash and the layer under that - plain white paper. The main paper for the back is some designer paper I used - added some Sticko swirls and Darice gems. on the very top I had two really old adhesive circle stickers I put on opposite corners and on top of the upper left hand side a metal embellishment that says GO FOR IT. I thought it was really different for me so I thought the phrase was fitting not only for that but for a neat "aged" Encouragement Card or something. Sure, it's a little funky, but I thought it was fun to make. Swing by my blog when you have a chance and thanks for reading! this stamp just takes my breath away! and did some background additions! Finish off with stickles, some black cord, a flower center and brad... and Done!!! For my Viva Las Vegastamps! blog post this week, I wanted to use a witch stamp that I got in my last order. So here is what I came up with. I ended up using three stamps from Viva Las Vegastamps! in my project. 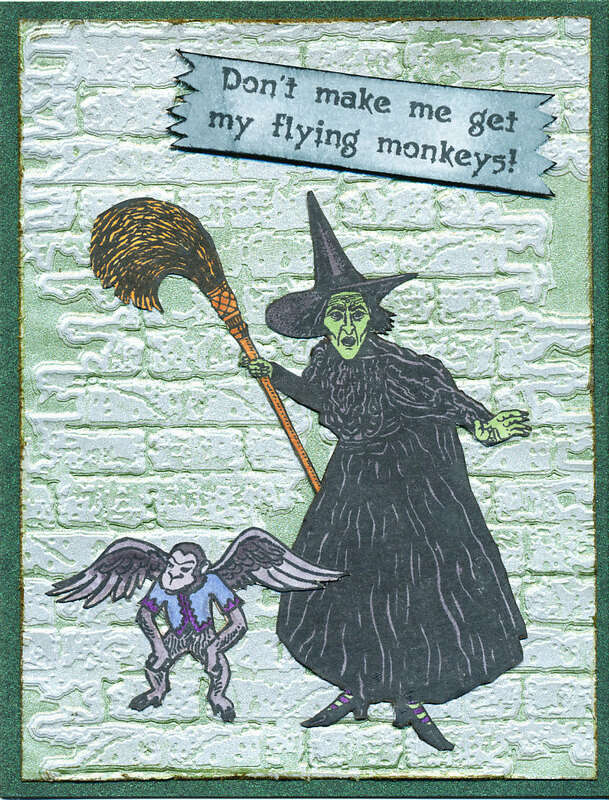 First, I stamped all three stamps on white cardstock with black Memento ink, and then colored the Wicked Witch With Broom stamp #10579 and the Flying Monkey #2530 with Copic markers. 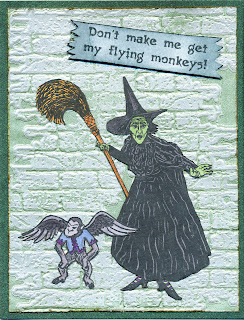 I cut them out and then I cut out the Don't Make Me Get My Flying Monkeys sentiment #10580 so that it would look like an old broken wooden sign. For the background, I used a piece of silver metallic paper. I rubbed green Memento ink on a Sizzix embossing folder and embossed the silver paper so that the green ink was pushed into all of the flat areas. I then mounted the embossed silver background onto a metallic emerald green card. I colored the sentiment sign with some Weathered Wood Distress Ink and then adhered all pieces to card as you can see in picture. I put the sentiment on small pop dots to make it stand out. 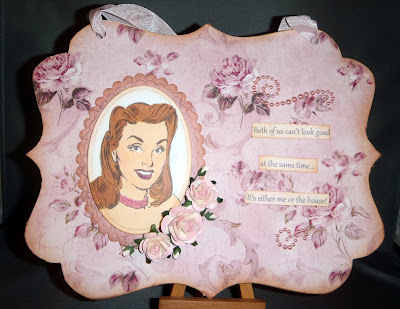 Please feel free stop by the Create & Craft blog to see all my projects in one place and say hello! I was asked by another member of the Viva Las Vegastamps! design team if I could post today in her place because she is travelling for a fun filled weekend. So I agreed and this is what I made! I fell in love with the Stained Glass Crane (#5013) stamp as soon as I saw it and ordered it on my last order. There are so many cool things you could do with this stamp, and so many different ways you can color it. Since I wanted really saturated and vibrant colors, I decided to use Copic markers to color this stamp. They worked great since I could use a different shade for each section. To mount my colored image, I used I piece of black mirrored cardstock and a piece of pearlescent maroon cardstock, both given to me by my good friend Kristi Parker Van Doren while we were at CHA together in Chicago last month. 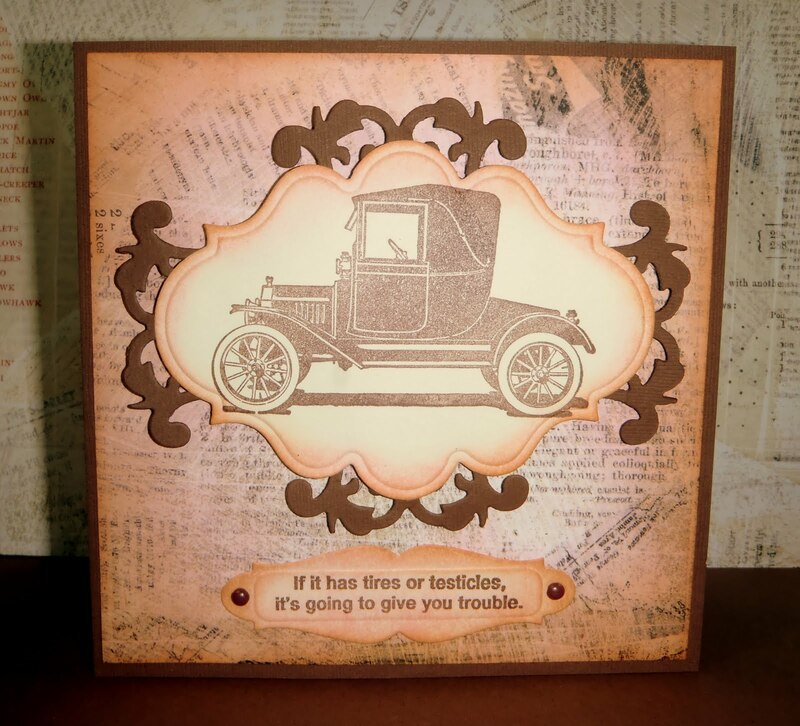 I embossed the maroon cardstock with a Fiskar’s texture plate and then assembled the card as you see in the picture. Feel free to stop by my blog to say hello or see my past postings as well as other cool projects and ideas from the rest of the Create & Craft team. Kim here! I have a wall hanging to share with you today that I made for my studio door. I wanted something girly that would also make my husband laugh. I started out with a piece of chipboard, painted the back of it, then used Miracle Tape to apply designer paper to the front of the chipboard. I then sanded the edges and distressed them with Tim Holtz Distress Inks. The Pretty Lady in Pearls was stamped with Rich Cocoa Brown Momento inks, then heat set for just a quick second. She is colored in with Copic Markers. The sentiment "Both of us can't look good at the same time...It's either me or the house", can be found here. the To finish it all off, I used some Nestibilities to cut the layers for the Pretty Lady, mounted her on the chipboard and added some flowers. The sentiment is cut up and distressed and then mounted on the chipboard. I then added a couple pearl flourishes. If you haven't been by Viva Las Vegastamps lately, go have a look! There are so many treasures in there just waiting for a new home!